Custom Diameter Adaptor for 11.5" to 12.5" diameter pail. This adaptor has bottom support and adjustable hold-down for pail 18" to 20" tall. Call (877) 742-5190 or click below for a custom quote. Custom Diameter Adaptor for 11.5" to 12.5" diameter pail. 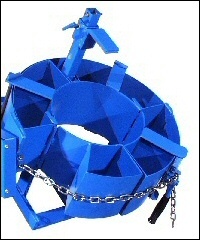 Has bottom support and adjustable hold-down for pail 18" to 20" tall.